An incredibly well made, flexible bag, that adapts to your travel needs. The best bag going for carrying camera gear AND travel gear. A great ecosystem that works together. Too big for everyday use. A full set up is expensive as all hell. 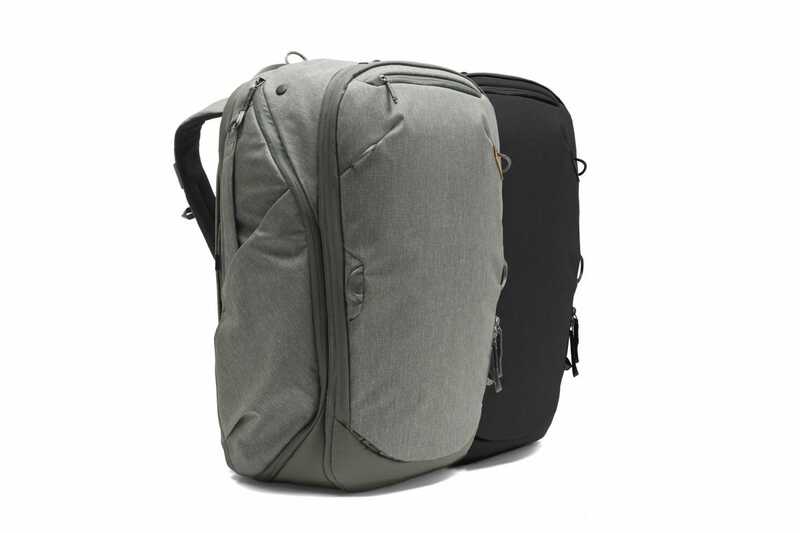 I have found my perfect travel bag: the Peak Design Travel Backpack 45L ($299.95). Now, it might not be for you but read on to find out why I love it. This summer, I spent two months living out of the Peak Design Travel Backpack. Literally, it was my only bag. With me, I had my laptop, camera, and enough clothes and other travel sundries not to scare away other hotel and hostel guests. I flew from Ireland to New York (where I spent a week) then got the train to Pennsylvania and Atlanta. After, I drove to Mobile followed by New Orleans. 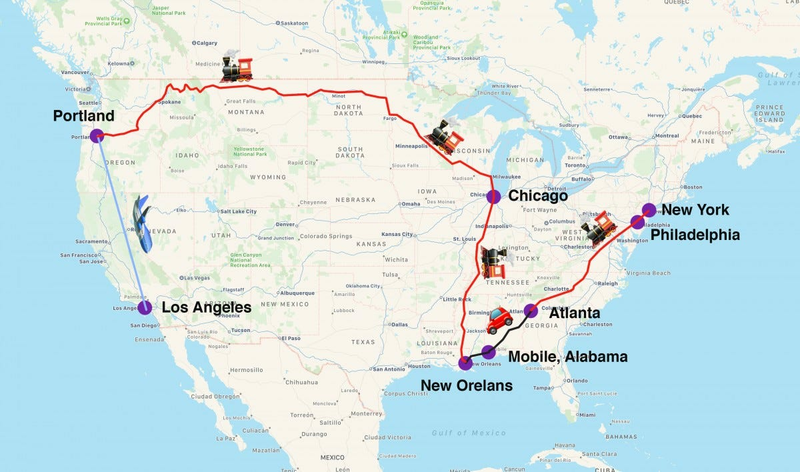 I then got the train from there to Chicago and on to Portland before flying to LA and then Mexico. In Mexico, we drove from Mexico City to Oaxaca and then through the mountains to Puerto Escondido. After two weeks going up and down the coast, we drove back along the same route and I flew home to Ireland via New York. I’m telling you all this, not to brag, but to give you an idea of what I put this bag through. It carried everything I needed—as a carry on bag, mind you—for thousands of miles of travel by planes, trains, and automobiles. It held up to every bump, kick, and rainstorm. So, let’s dig in. Peak Design is, first and foremost, a camera gear company. Their first product was a clip for mounting your camera on your backpack strap and they’ve only grown from there. I’m emphasizing this because I have been searching for the longest time for a great camera travel bag. Until now the market has had either great travel bags—like the Minaal Daily Carry ($299) or Cotopaxi Allpa ($220)—or great camera bags—from the likes of f-Stop—but there has been nothing that comfortably carried my camera, laptop, and a few days clothes that still counted as carry-on on most airlines and didn’t need to be completely unpacked at airport security. So really, this is where the Travel Backpack hits the mark—hard. It’s the best bag yet for anyone who travels with a full camera set up but not an excessive amount of gear. The modular camera cubes, ranging in size from small ($49.95) to large ($89.95), clip securely into the bag and can carry anything from a single DSLR and lens to, if you need it, a full two DSLR, four lens set up. I used the small camera cube and my Canon 5DIII, 17-40mm f/4, and 85mm f/1.8 both fit in perfectly. If you need to carry more camera gear then you just go with a larger camera cube—at the expense of regular bag space. If you don’t travel with a camera, the Travel Backpack is still an incredible backpack—one of the best, if not the best, around—but there is at least some other competition from the aforementioned Minaal and Cotopaxi bags. On the other hand, for YouTubers, Instagram influencers, travel photographers, digital nomads, and anyone else who, like me, travels a lot with an expensive camera but doesn’t want to bring a dedicated protective camera bag, it’s perfect. And that’s the other part of things: people who travel a lot. The Travel Backpack is a big bag. In its default state it’s 22”x 13”x11” with a 35L capacity. This scrapes in under the minimum carry on allowance of most airlines though, if you’ve fully packed it, you’ll almost certainly blow right through whatever weight limit there is. It’s also possible to configure the bag to two other sizes: a 30L day bag and a 45L gear hauler. The only change to the dimensions if you do this is to the depth so, even in the 30L day bag set up, it’s still far from a small bag. This is all great if you want to carry everything you need for a trip with you but, if you’re looking for a day to day back you can just grab and go with, it’s a bit big. When I’m at home in Ireland I actually prefer to use Peak Design’s 30L Everyday Backpack ($289.95) since it’s a bit less cumbersome (it, along with Peak Design’s Everyday Sling, featured on our best camera bag list). The last five paragraphs have really been a long-winded way of saying that the Travel Backpack is, unsurprisingly, an incredible travel backpack (especially if you travel with a camera), but, if you are looking for a bag to take to the coffeeshop, it’s a bit big—and way too specialized and expensive for your needs. If you’ve read this far then you probably think the Travel Backpack might fit your needs. 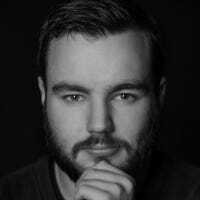 Let’s go a little deeper into the specs and other important details. 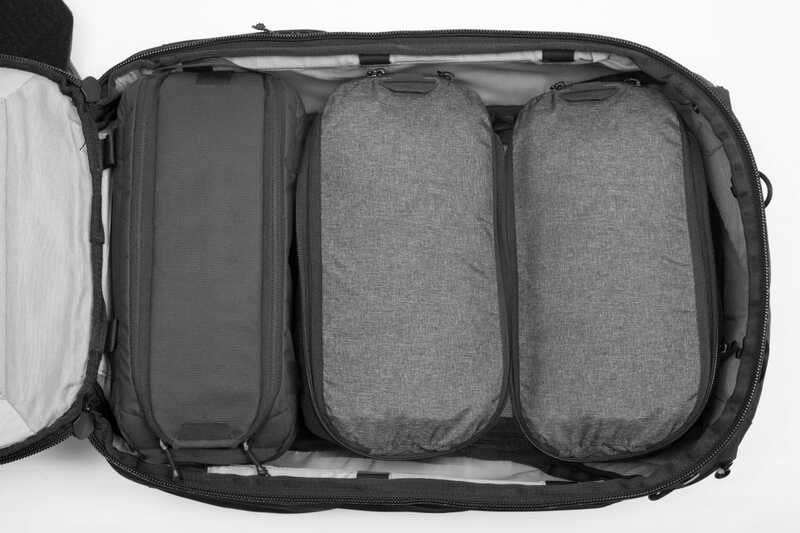 Although marketed as a 45L pack, in its default carry-on approved set up, it holds 35L worth of gear. Although you can just toss everything into the main compartment, it’s meant to be used with Peak Designs Travel Line accessories—including packing cubes. The bag can hold three “units”. 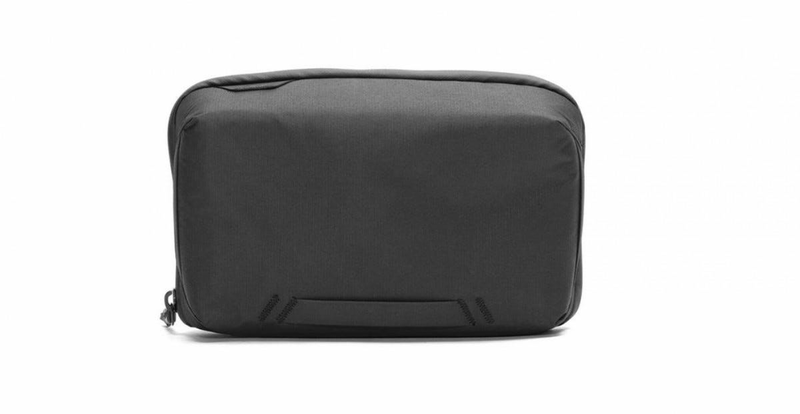 The small packing cube ($29.95) takes up one unit, the large ($39.95) takes up two. The small camera cube takes up two units, the medium takes up two, and the large takes up three. This means you can fit a small camera cube and large packing cube or medium packing cube and medium camera cube, or a single large camera cube in the bag. I used a small camera cube and medium packing cube when I was traveling. They’re both incredibly well made and packed perfectly together. 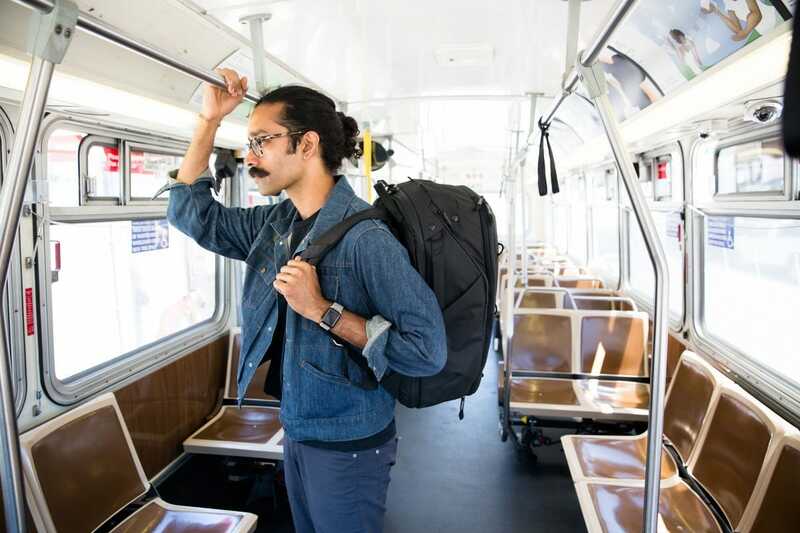 If you’re going with the Travel Backpack, it’s worth your while taking a serious look at the rest of Peak Designs travel line. Since the bag is so big, just tossing things into it will get messy. On the subject of putting stuff in the bag, let’s look at how you can do that. 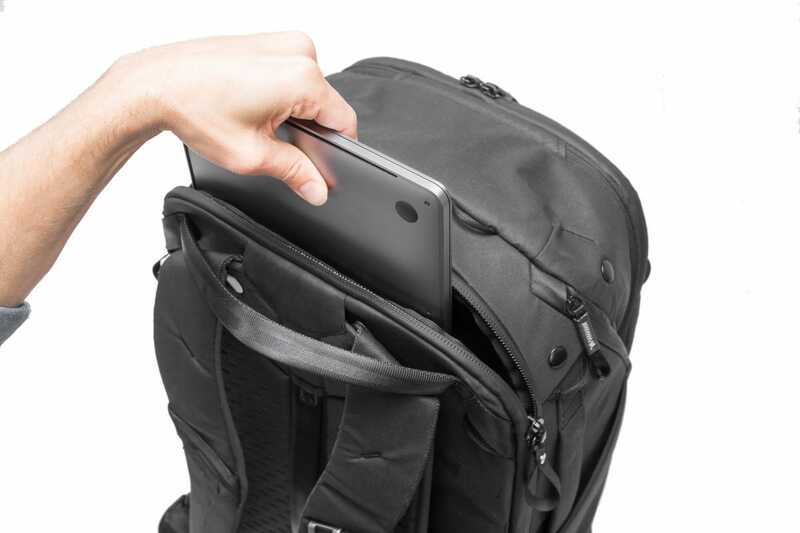 The bag has three compartments: a laptop (up to 16”) and tablet (up to 10”) compartment on the back that’s accessible from the top of the bag. The main internal storage compartment is accessible from either the back or the two side zips. The smaller front compartment is accessed from the front and contains four zipped pouches for organizing your stuff. If you want, you can fold away the divider between the small and main compartment (losing two of the storage pouches) and also have front access to the main compartment. There’s also two side pouches for things like water bottles and a tripod and a small zippered compartment at the top for your passport or sunglasses. 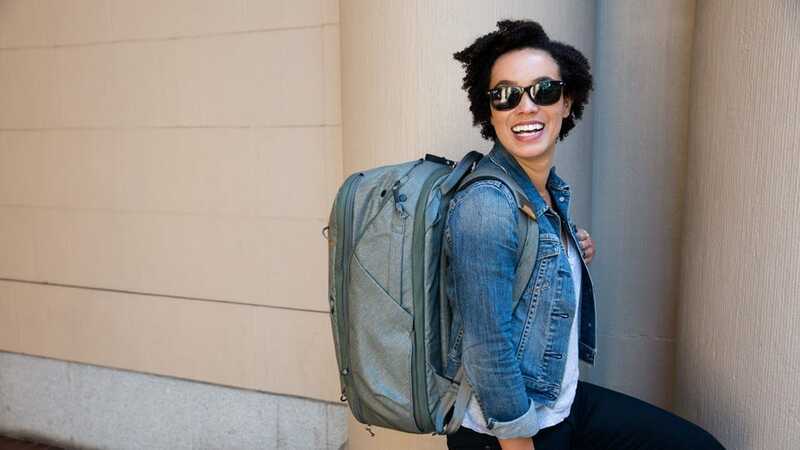 If you’re used to a top loading backpack, it can take a bit of getting used to but, once you learn to work with it, it makes it simple to keep your laptop, liquids, and other important items accessible. The bag itself is incredibly well made. The exterior is weatherproof 400D nylon so, if you’re caught out in the rain, your gear isn’t going to get soaked instantly. There’s an optional rain fly ($29.95) if you really need your bag to be waterproof. It also held up to sand, mud, kicks, scuffs, scrapes, and assorted other abuse. There’s even a lifetime warranty if something does go wrong. As part of the Travel Line, Peak Design have also released two pouches: a Tech Pouch ($59.95) and a Wash Pouch ($59.95). The Wash Pouch is a great, well organized Dopp Kit, and it’s quickly replaced my previous one. It’s the Travel Pouch, however, that I think readers of Review Geek are going to find most interesting. All this stuff is oddly shaped and awkward to pack. I’ve tried every cable organizer or tech kit I could get my hands on and they’ve all fallen short. If they’ve handled cables well there was nowhere for my camera charger and vice versa. Or worse, if they could handle everything it was such a faff to stow things or get them out that I ended up just tossing everything in unsorted. The Tech Pouch, with its flexible dividers and multiple compartments, is the first tech storage set up I’ve found that’s overcome all these problems. The small compartments make it easy for me to quickly put my cables away and keep them separate without having to fiddle around with elastic bands. The larger compartments hold all the bigger objects, including my MacBook charger easily. 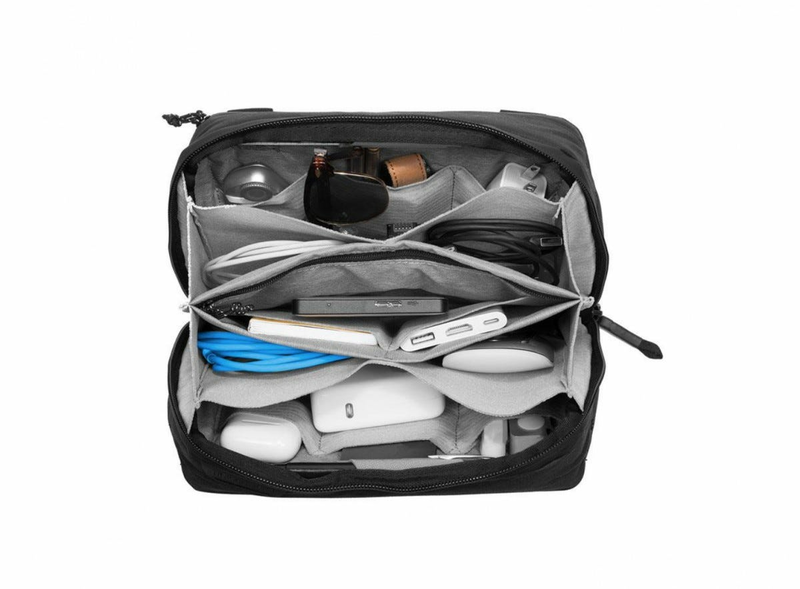 Even if you’re not interested in the Travel Backpack, I’d suggest you check out the Tech Pouch. Okay, so it should be pretty clear by now that I’m a big fan of the Travel Backpack. It checks almost all my boxes. So, what’s not to like? The other elephant in the room is the price. Peak Designs’ products have never been cheap and the Travel Backpack is no exception. They’re able to make such awesome, well designed, products with lifetime warranties because they aren’t trying to undercut anyone. At $300 for the bag plus $60 for the tech pouch plus $50 for a camera cube plus $30 for a packing cube plus whatever else, even with a bundle discount, you’re not likely to see too much change from $500. That is a big ask and, while other bags have their own accessories, they feel a little more necessary with the Travel Backpack. A generic camera pouch won’t clip in. The Peak Design Travel Backpack is the best bag I own. It’s perfect for long-term, one-bag travel—especially if you’re bringing a camera. The only big downside is that, for perfection, you pay a price. It’s tough to wake up in the mornings sometimes. Your bed is cozy and warm, and who really wants to face the working day every day? No alarm clock will physically throw you out of bed, but there are plenty of great options for heavy sleepers. We’ve rounded up some of our favorites.